This entry was posted in Randy's blog entries on February 5, 2019 by randy. For years, I recommended Encouraging the Heart by Kouzes and Posner as the first book a new leader should read – and, really, any leader should read. I still love, and recommend, the book. 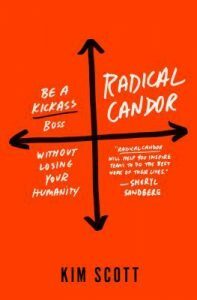 But my current new first recommendation choice is Radical Candor by Kim Scott. It is a great, practical, usable, put-this-to-work immediately kind of book. I think about this book a lot. It pops up often in my thinking about leadership issues and challenges. I recommend it in many, many of my speaking engagements. Her premise is clear: a leader has to Care Personally and Challenge Directly. 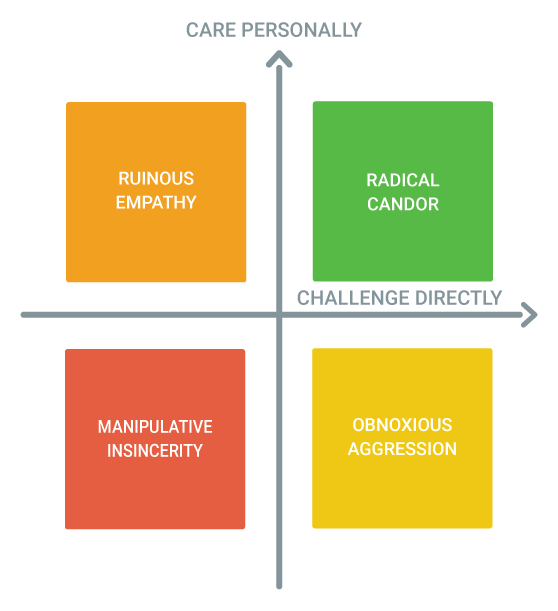 The obvious best approach to leadership in these four quadrants is that of radical candor. Well…with apologies to Kim Scott, I’ve come up with a “fifth quadrant.” (Yes – I do know that there are only four in quadrants). I think, as you read her book, you realize that leaders who sincerely want to lead can fall into any of the four quadrants. But this fifth quadrant “leader” is another kind of leader altogether: one who is not seeking to lead, but just seeking to personally focus on self alone. In other words, the people they “lead” are necessary evils to them. They seek not to lead their people, they seek just to use their people in pursuit of their own agenda. Selfish obliviousness — that leads to mean-spirited ugliness. The fifth quadrant is mean-spirited ugliness. The person who “leads” this way is selfish, and thus oblivious to human need. This “leader” pays no attention to the people he/she is “leading” except as tools to use. I think the three less-than ideal quadrants in Kim Scott’s model still assume a noble intent and motivation for the leader. This selfish leader has no such noble intent. They somehow arrived at the top of a rung – maybe they started the company – and now, they chew people up and spit them out. I think we have all seen such “leaders” at work. They are devoid of empathy. They are incapable of genuine listening. They are inattentive, in every way, to human need, and struggle. They are utterly toxic to the workplace. So…if you work for such a selfish, oblivious “leader” who demonstrates mean-spirited ugliness, run to a better workplace, and fast. Alas, giving such a leader a copy of Radical Candor to read is likely not going to fix their problem. 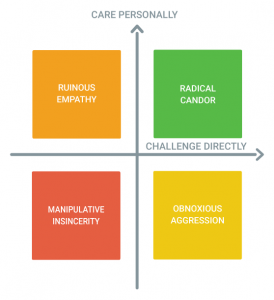 Click here to read my blog post: Radical Candor by Kim Scott – My Six Lessons and Takeaways. You can purchase my synopsis of Radical Candor, with the audio recording of my presentation along with my comprehensive, multi-page handout, at the buy synopses tab at the top of this web page. (And also, my synopsis of Encouraging the Heart — and many other very good books).